Once we were stocked back up on energy bars and bottles of water and Gatorade, we went back into Arches National Park to close out the afternoon and watch our last sunset in Moab, Utah. 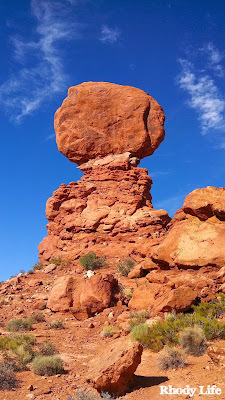 Once we entered the park again, our first stop on our way to our sunset destination was Balanced Rock. 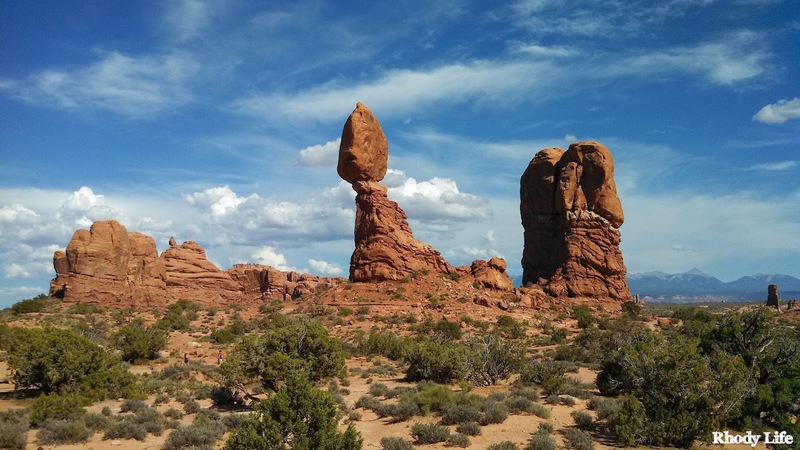 While this attraction is located at the base of the road that leads into the Windows section of Arches, we hadn't stopped here to check it out yet. It's right on the corner of the two roads, so there isn't much of a hike to get to it, but there is a pathway that allows for you to walk around the rock structure, so we did that and took some pictures. It was getting pretty busy in this area, as the park was hosting an organized meteor shower viewing at that location that night at sundown, so we only spent enough time there to grab some photos. After our quick view of Balanced Rock, we drove East to the trail to Delicate Arch. When researching Arches National Park, one of the most popular answers for "best sunset" was Delicate Arch. What I didn't see in my research, however, was the "Strenuous" tag that accompanied the explanation of the hike to the arch. That hike was hard. And that may be an understatement. I think that the hardest part of the hike was that we were doing it at an elevation of 4500 feet! In order to understand how much of a difference this made for us, you must know what the highest point in the state of Rhode Island is. The highest point is 812 feet above sea level. Yes, you read that right - 812. That means that we were averaging more than five times the elevation that we are used to. That makes a big difference in our breathing, and boy could I feel it when we were making that hike. The climb itself over the 1.5 mile trail is 800 feet, and while you're probably thinking that 800 feet over 1.5 miles isn't too terrible, just remember that those 800 feet are only divided into two spots, so you're doing 400 feet over 1/4 mile, and the rest is downhill or flat. It was brutal, especially because the sun was at our backs the entire time, we were walking up a rock face in full sunlight, and it was hovering around 90 degrees. And the last leg of the hike is a winding cliff trail that goes along the edge of a large boulder. The pathway is no bigger than three or four feet wide, which is scary, because the drop would be straight down about 300 feet. But, I will tell you, that once I rounded that last turn at the top, seeing this straight ahead of me was so rewarding. After taking our turns in getting the obligatory pictures under the arch, I talked D into leaving and not watching the sunset from up here as planned. I thought it was best that we not attempt that hike back down after dark, especially considering how steep it was and how many people were up there, crowding the space. Instead, I suggested that we find a spot up at the North part of the park to watch the sunset. On our drive back up towards Devil's Garden to fill up our now empty water bottles, the sun was quickly setting. I found a pull-off on the side of the road, and we climbed up a boulder and sat down to watch a sunset that was even prettier than the night before. We had this spot all to ourselves, and it was perfect. We had the most beautiful view of the sunset, plus we didn't have to share it with anyone else. An added bonus? There was a lightning storm along the horizon, just left of the sun setting, which was really cool to see. This was such a great end to an action packed and busy day. But, we still had a few more hours left the next day in Moab, so I have just one more post about Canyonlands National Park before I get to our time in Yellowstone National Park. I'm seriously ready to live in one of your photos (no matter how harsh the desert weather can be)! What an experience you had!!! I love the West!! It's so different there!!! Amazing photos! They really make me want to travel out west.